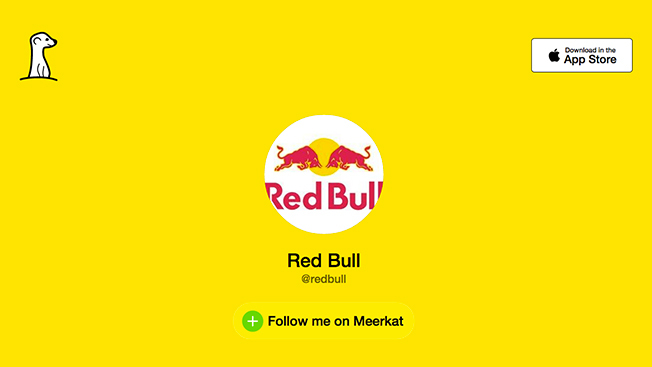 Meerkat, the South by Southwest darling, surpassed the 300,000 user mark around four days ago and stated on March 15 that it was growing 30 percent daily. Today, the one-month-old startup told Adweek it is still jumping 30 percent every day but wouldn't confirm a new user total. The back-of-the-napkin math now puts it well over a half-million downloads, underscoring why Red Bull, Starbucks, the Miami Dolphins and BuzzFeed are already testing the app, which is like a social-video version of FaceTime that incorporates Twitter. For instance, BuzzFeed today is using Meerkat to live-stream the vigil for Zayn Malik—a teen-driven, OMG reaction to the pop singer leaving the group One Direction. Early Wednesday afternoon, Ryan Cooley, Meerkat community director, explained that his tech company intends to be increasingly responsive to brand marketers' needs as time progresses, but for now, it doesn't want to lose its democratic appeal to consumers. "It's only 30-days old, so we don't want to create a premature hierarchy within the platform," he said. "We want to make sure the core experience is the best we can make it for everyone. It's going to be a product for the people, whether you have 40 Twitter followers or 18 million followers." While these are proverbial "early days" for Meerkat, we asked a handful of digital shops about the marketing capabilities they'd like to see soon from the app. Here's a four-item wish list from marketers. Ryan Fey, co-founder and chief brand officer of Los Angeles-based Omelet, said he envisions a product with both native and real-time advertising qualities, allowing brands to participate with video streams as they happen on consumers' mobile phones via online auction-styled bidding. Let's call them real-time tag ads. "For example, I could see the potential for a new pay-as-you-stream model that captures additional revenue by alerting advertisers—or their agencies—to content that was about to be shared in real time and thus giving them the chance to be 'tagged' or included alongside the relevant content as it was streamed," he proposed. "Obviously it would have to be secure and suitable content for a brand to interact with. But by understanding the audience first, as well the ability to quickly evaluate the risks associated, the perceived 'real-time' benefit that a brand could get from that content could be worth the risk." Matt Heindl, senior director of social media marketing at Razorfish, said a big Meerkat marketing pain point so far is the platform's fleeting nature, adding that it would be great to save live-stream content for later use. "I have run many, many live-streams for brands [on other platforms like YouTube], and those streams typically get a lot more views after the fact than during the stream itself," Heindl said. "If TiVo and Hulu have taught us anything—today's consumers want to watch content on their own schedule and not have to 'tune in.'" Andrew Cunningham, community lead at Huge, echoed Heindl's sentiment about saving footage, citing the ability to do so on Periscope, Twitter's recent $100 million acquisition (and, separately, the competitive reason it recently blocked Meerkat's auto-tweet feature). "When users miss a stream [on Meerkat], they are simply directed to a 'stream has ended' screen, which is unappealing when users are just getting acclimated to the platform," he remarked. "This could easily be fixed soon, but is definitely a drawback for the time being." Brands need more content-developing tools before they'll come in droves, predicted Layne Harris, 360i's vp of innovation technology. "The dependency on using Meerkat as an app, rather than a full-fledged platform, is a limitation for most marketers," Harris said. "As creators, quality control is an essential part of our process, and tasks such as managing talent, content moderation, and even the choice of devices we use are much more challenging when tied to an app—especially when dealing with live content. "The lack of control could make legal teams nervous as well. If and when Meerkat has an open [applications protocol interface] and recordings can be archived, potentially edited, and even created outside of the app on more sophisticated devices—such as on a GoPro—I think we will see much more brand participation." Razorfish's Heindl added this technical-production request: "[I'd like to see] multiple feeds into one stream-cast, allowing multiple 'cameras' or feeds of a single event. Sometimes a single, shaky iPhone does not cut it—especially at a large conference or product launch/demo." And Cunningham from Huge suggested that future features let brands distribute their Meerkat video far and wide, rather than simply living via the app and Twitter. "It [now] feels very tied to one-off events and less like a new channel to share content," he said. Compared to industry peers, Firstborn senior strategist Scott Fogel was more upbeat about the current Meerkat, contending that there were already possibilities for marketers to explore, such as live interviews and product launches, as well as behind-the-scenes tours. At the same time, he would appreciate additional bells and whistles and—while he's not interested in coupons in his mobile-social video streams—he thinks retailers would be drawn to doing Meerkat discounts. "There are undoubtedly features that Meerkat could add to entice more brands to join, namely the ability to tie together streams and cut between them," he said, "or the option to send coupons or messages to people who are tuned into a stream." Lastly, and to the point Meerkat's Cooley made, Fogel warned against the app rushing in with brands, saying "these added features could threaten the allure of live-streaming—the idea that what you see isn't overly orchestrated, or produced, and [remains] true to real life."